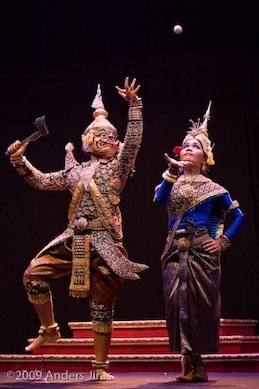 The yearly Lakhaon international theatre festival was running from 2007 to 2012 in Phnom Penh, organised by the French Cultural Center / French Institute. Here are photos of Ayai Roeurng, Bauk Bot, Lakhaon Ape, Lakhaon Bassac, more Lakhaon Bassac, Lakhaon Kbach Boran, Lakhaon Ken, Lakhaon Komnap, Lakhaon Mohori, Lakhaon Niyeay, Lakhaon Pleng Kar, Lakhaon Pol Srei, Lakhaon Promotey, Lakhaon Sbaek Por, Lakhaon Trab, Lakhaon Yike, Sbaek Touch and other theatre and dance forms. Mais où est passé Monsieur Sanghak?